Igloo makes an entire line of refrigerators and “chilling equipment”, including light-up party bar coolers, rugged terrain-crossing coolers, insulated bags and cooler jugs. It’s large, space-efficient and can be positioned horizontally like a traditional ice chest or upright like a mini fridge. It even comes with an adjustable shelf, so that you can keep drinks, snacks and other items organized and easy to access. Just plug it in to the 12V outlet in your car, RV or boat. It will chill everything inside to 38 degrees below the air temperature outside. It features a convection cooling system, which circulates cold air via a built-in fan. This enables plastic bottles to cool just as fast as cans. No ice needed! With the Igloo Power Converter, you can even use this unit in an office, house or dorm room. This adapter is nice to have, especially if you like to have backyard barbecues in the summer. Keep drinks chilled without having to buy ice or having to direct guests to your refrigerator. This larger model is not great for using as a personal cooler where you don’t need to chill many items. It will consume too much energy, plus it is big and bulky. Also, since this is a larger unit, it does not come with a carrying handle or shoulder strap. This makes it less convenient to carry out of the vehicle. The 40-quart is most user-friendly when it is set up in once location where you don’t have to move it often. 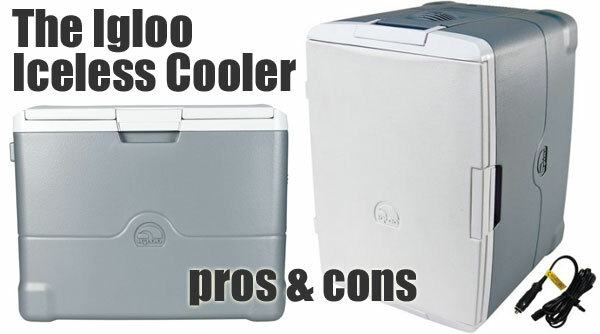 Igloo also makes a smaller 26-quart version of this cooler. Below is a review that I think applies well to both model sizes. The features are almost identical except for the size. The smaller unit does include a handy carrying handle rather than the two side flip-up handles. Approximate dimensions of the 26-quart are approximately 18 x 13″ x 16″. Don’t let water get in or around cooler fan vents. Wipe down surfaces between uses and make sure unit is dry before you store it. Empty cooler immediately after each use to prevent stains and odors. Baking soda combined with a small amount of water is a great method for removing tough stains.